How to convert text into PDF? Question😀 Does your product work with text document? I would like to setup a hot folder that will convert test documents into PDF. 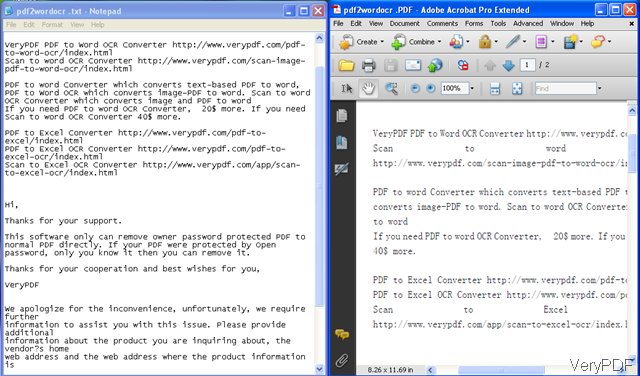 Solution: Software VeryPDF InfoPath to PDF Converter can help you do that. You can download it to your computer to have a free trial. This software nearly can convert all the Office files, like Word, Excel and PowerPoint, InfoPath file and others. Now let us check how to convert text to PDF. First, download Office to Any Converter to your PC. Go to this software website and you will find price list. Please click Download, then you can free use this software many times, like I showed in the Fig.1. Install Office to Any Converter to the computer. After downloading, there will be an exe file of in the download package. Please double click it till there is an icon showing up on the desktop, which is an indicator that you have installed this software successfully. Double click its icon you can open software, the following snapshot is from the Office to Any Converter interface. Please click Add files to check all the supported input formats. Second, run the conversion from text file to PDF. As requested in the question, hot folder is needed. So please choose Add folders to add a whole folder files to this software. Or you can use the Hot Directories Mode at the bottom of the software interface. When you click it, the following snapshot will enter your eyesight. Here you can Browse the open folder and output folder directly. The Setting will lead you to the setting menu tab. If back to main interface needed, please click button Return to Batch Mode . Fig. 3. Hot Directory Mode snapshot. In the setting part, you can set limitations according to your needs. If setting part finishes, please click Start to run the conversion. If run the conversion in the batch mode on the main interface, please click button Convert to Any and Save as. Up to here, I can the conversion from text file to PDF can call an end. Now let us take a random text file for example to check the conversion effect. The following comparation snapshot can prove more than words. During the using, if you have any question, please leave us a comment here, we will reply you as soon as possible. TXT2PDF Advanced Settings, any changes that I make are not saved, how to let Text to PDF Converter remember my settings? How to convert text file to PDF file with 48 text lines per PDF page? How to convert text file to PDF file from C#? How to convert Excel, Word to PDF without decreasing PDF quality? How to convert word to PDF and delete empty pages without MS Office installed? How to convert Office to image and resize image through software interface? How to convert PowerPoint to PDF and add watermark through software interface? This entry was posted in Office to Any Converter and tagged text to PDF. Bookmark the permalink.